Climate science isn't an absolute truth, but it's more like maybes, according to a Canadian professor from University of Guelph who spoke at Indiana State University as part of the Darwin Keynote Speaker Series "From Molecules to Ecosystems." 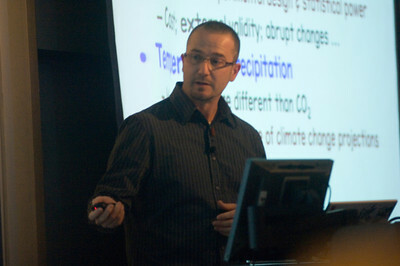 Jonathan Newman, professor and chair for the environmental biology department at University of Guelph, stated that scientists can't answer how the impact of climate change affects the ecosystem. "People think impact science is as far along as climate science and it's not," Newman said. Newman stated carbon dioxide is important because it affects photosynthesis, transpiration, carbon nitrogen synthesis and shoot partitioning. "Carbon dioxide is roughly the same everywhere in the world," Newman said. "Elevated carbon dioxide is the question to deal with in climate change." Free-air carbon dioxide enrichment (FACE) is the gold stand experiment that measures carbon dioxide concentration in plants and it's a safe area of climate research because scientists know that gas concentration levels are increasing, according to Newman. "It is in every other way just open to the environment," Newman said. "It is an intact ecosystem with all of its natural co-evolved interaction going on." Scientists encounter problems when doing FACE experiments including difficulty repeating the experiments because they are expensive and time consuming; need plenty of room; are located solely in Western Europe and United States instead of around the world; and can't predict long term affects. Newman suggested cheaper alternative since most FACE experiments are closing. Open top-chambers could be used despite having higher temperatures and carbon dioxide levels, higher relative humidity because of increased temperatures and scientists not having easy access to animals inside the chamber. Another alternative experiment is indoor chambers but scientists don't have real soil process because they lack real soil. "As a consequence of these compromises you have to make to get the cheaper ones in; you sacrifice external validity, you get some chamber affects," Newman said. Newman explained the lack of statistical power, producing variable results, short-term experiments and abrupt changes in carbon dioxide levels cause problems for FACE and alternative experiments. Scientists can't answer the affects of warming on climate change because large climate models give climate projections so for it work; scientists record how much greenhouse gas is in the air into the models. Climate modelers look at standardized scenarios determined by population and economic growth, technological development and social and political will to curb greenhouse emissions, he said. "These scenarios are just alternative views of what the world may look like in the future," Newman said. "They are reasonable, they are consistent, but once they generate emissions then those emissions can be fed into a climate model that can produce projections and then we can use those to predict the impact." Precipitation is another climate impact studied by scientists and there are two models but an experiment would be difficult because the models don't agree, he said. Bioclimatic envelope models can imagine an organism has a temperature range where it can exist but it can't exist if it is too hot or cold. Physiological phase models capture the physiology of the organism where scientists mathematically map out details about the organism and then they study how it responds to temperature, precipitation and carbon dioxide. "It turns out there are a number of very serious methodological limitations to being able to saying something specific about climate change impacts," Newman said. "Within that variability, we can get every possible answer."